On the Lithology Field tab in EDGE, the Lithology Wizard opens when clicking to add a value in the Classifications field (mapping to DT_LITHOLOGY.REMARK_1). The options in the Wizard are populated from two reference tables, RT_LITHOLOGY_COMPONENT and RT_LOOKUP. These work together with Material Groups to generate the custom values. This option requires entering the data into several EQuIS database tables in advance of creating the Reference Values (RVF) file (or re-creating a new RVF file) as explained in Create a Reference Values File (.rvf). To create new reference values, follow the instructions found in Create Groups for Custom Activity Lists using the geowizard_component and geowizard_lookup sheets in the Configuration EDD. 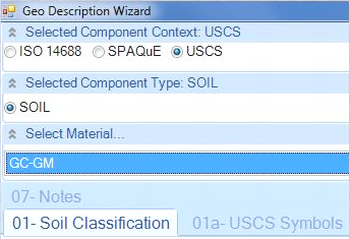 1.The Component Context controls which options are available throughout the Lithology Wizard. The Component Context is controlled by RT_LITHOLOGY_COMPONENT.COMPONENT_CONTEXT. The following screen shot shows that each of the three different Component Context elements may contain entirely separate questions, options and languages. 2.The Component Type also controls all lower level options and is controlled by RT_LITHOLOGY_COMPONENT.COMPONENT_TYPE. This is usually used to determine different lithological groupings. Please note the following examples. 3.Select Material displays values from RT_MATERIAL.MATERIAL_NAME. The values in this drop-down may be filtered according to Component Type by creating a Material Group with the same name as the Component Type (e.g. FINE SOILS, COARSE SOILS etc). The value entered under Select Material controls the graphics that appear in borehole logs created in third-party interfaces e.g. LogPlot, gINT, HoleBase. 4.The Group_Date in Group Details must also be populated for the filter to work. 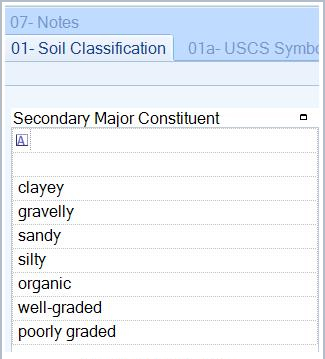 4.The Geo Description Wizard at the bottom of the EDGE Lithology Wizard, presents a series of tabs with options for data entry. Each tab is created by RT_LITHOLOGY_COMPONENT.COMPONENT_CLASS. 5.Each COMPONENT_CLASS tab may be further subdivided into sub-sections. It is recommended that no more than six to eight sections are used to prevent the screen from becoming too busy. Each tab is created by RT_LITHOLOGY_COMPONENT.COMPONENT_CODE and COMPONENT_CLASS. The tabs are ordered alpha-numerically on RT_LITHOLOGY_COMPONENT.COMPONENT_CODE, but display RT_LITHOLOGY_COMPONENT.COMPONENT_DESC as the tab title. 6.Each Component Code tab may be formatted for free data entry, or formatted to include lookup values. For free data entry, no further action is necessary. Unique identifier for the value. This value will not be displayed in EDGE. Values will be sorted alphanumerically according to this field. The value to be displayed in EDGE. Descriptive value to be displayed in EDGE.